Reachability, which answers whether one person is reachable from another through a sequence of contacts within a period of time, is of great importance in many domains such as social behavior analysis. Recently, with the prevalence of various location-based services (LBSs), a great amount of spatiotemporal location check-in data is generated by individual GPS-equipped mobile devices and collected by LBS companies, which stimulates research on reachability queries in these location check-in datasets. Meanwhile, a growing trend is for LBS companies to use scalable and cost-effective clouds to collect, store, and analyze data, which makes it necessary to encrypt location check-in data before outsourcing due to privacy concerns. 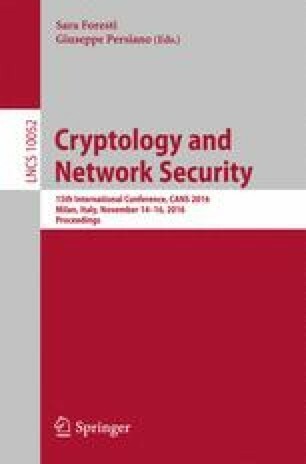 In this paper, for the first time, we propose a scheme, SecReach, to securely evaluate reachability queries on encrypted location check-in data by using somewhat homomorphic encryption (SWHE). We prove that our scheme is secure against a semi-honest cloud server. We also present a proof-of-concept implementation using the state-of-the-art SWHE library (i.e., HElib), which shows the efficiency and feasibility of our scheme. We would like to thank the anonymous reviewers for their valuable comments. This work was supported by the US NSF grant CNS-1218085, the 111 Project of China (No. B16037), the National Natural Science Foundation of China (No.61272481, No. 61572460), the National Key Research and Development Plan of China (No. 2016YFB0800703), and the China Scholarship Council.